For most of her adult life, Ramya Ragupathi had suffered from acute rhinitis and sinusitis. So when she turned 30, she embarked on a health and wellness journey in a bid to combat her chronic health issues once and for all, and started reading up on the idea of “you are what you eat”. But the turning point came in 2013, when her hair started falling out. “That was my body talking to me,” she says. She turned to a naturopathic doctor who put her on a strict no-wheat and no-dairy diet. “I felt so much better and also lost weight. You realise that a lot of these health issues come from eating foods that are not good for you, causing inflammation in your cells,” Ramya tells us. No mean feat for a self-proclaimed foodie, especially one who has been baking since the age of 16. Beside her daily food intake, she started changing up her baking repertoire, looking at recipes that use no wheat and dairy. She was in Europe studying for her MBA then, and later working in the impact space, so gluten-free foods were more readily available than they were in Singapore. 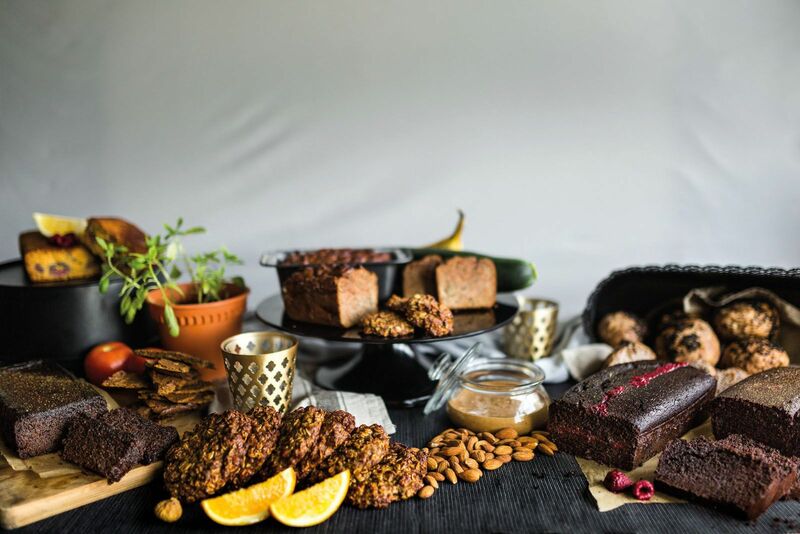 When she returned home in 2016, armed with a chocolate cake recipe that she had perfected and got her friends raving about its moistness and richness, Ramya founded food manufacturing company, Oh My Goodness!, which specialises in gluten-, dairy- and refined sugar‑free food, making them available, accessible and affordable to “fellow sufferers” with food allergies and sensitivities, or those who simply want to eat better. In fact, this concept of conscious eating is in line with the “Rethink Your Food” theme of the inaugural World Food Future for Women (WFF) conference on March 26, at One Farrer Hotel. Organised by Halo Health Asia, a new social enterprise helmed by women’s issues advocates Trina Liang‑Lin and Mrinalini Venkatachalam, this first-of-its-kind conference brings together various stakeholders, including businesses, academics, and consumers, to discuss key food and nutrition issues affecting families and children. As women are generally the main guardians of their family’s food purchases, this initiative aims to keep consumers up to date on the latest research and innovations. At the same time, WFF also wants to spotlight women who are making an impact in the food and nutrition industries. Ramya founded Oh My Goodness! as a lean start-up operation, and after its first year, she wanted the business to have a social mission of providing employment to disadvantaged groups. In 2017, the company received the VentureforGood grant and became a member of raiSE, the Singapore Centre for Social Enterprise. Today, its operations team is made up exclusively of ex-offenders and persons with intellectual disabilities. One thing is clear: “You’ve got to be a business first. You want to create products that people really love. I’m happy to say that most of our customers actually come back.” Its signature Golly dark chocolate cake aside, Oh My Goodness! has since expanded its product lines to include breads and cookies, and even a vegan Golly Vee lemon raspberry cake. This is thanks to a rigorous research and development process that Ramya describes as “precision engineering”, which starts first in her home kitchen before arriving in the Oh My Goodness! production factory in Mandai. The company supplies to selected food establishments, including SaladStop! and Toby’s Estate, and its products are also available online at its e-bakery (ohmygoodness.co) as well as RedMart. “My rule is if I won’t eat it myself, I’m not selling it. That’s the benefit of being a sufferer because I know what people who share my allergies and sensitivities miss and crave for,” enthuses Ramya. Her biggest craving? “It’s got to be pizza!” So naturally, pizza bases are next on the menu. Singapore has the second-highest proportion of diabetics in the world among developed nations, according to a report by the International Diabetes Federation 2015. If nothing is done, diabetes is projected to affect more than one million Singaporeans by 2050. The net proceeds from WFF will fund the pilot programme called FoodSteps, which will be rolled out in Q2 this year, with 10 schools in the South West Community Development Council participating. Through hands-on learning and with content created by the Halo Health Asia team in consultation with educators and experts, children will be introduced to the fundamentals of food and nutrition. This is followed by a volunteer-led discussion that enables data gathering on the students’ own meal practices as well as the proposed changes they intend to make based on what they have learnt. The programme can be run as individual modules or as a tiered programme across different ages.